Abstract : The visual focus of attention (VFOA) has been recognized as a prominent conversational cue. We are interested in estimating and tracking the VFOAs associated with multi-party social interactions. We note that in this type of situations the participants either look at each other or at an object of interest; therefore their eyes are not always visible. 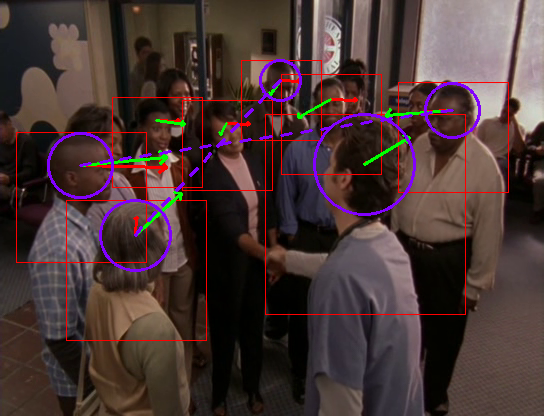 Consequently both gaze and VFOA estimation cannot be based on eye detection and tracking. We propose a method that exploits the correlation between eye gaze and head movements. Both VFOA and gaze are modeled as latent variables in a Bayesian switching state-space model (also referred switching Kalman filter). The proposed formulation leads to a tractable learning method and to an efficient online inference procedure that simultaneously tracks gaze and visual focus. The method is tested and benchmarked using two publicly available datasets, Vernissage and LAEO, that contain typical multi-party human-robot and human-human interactions.